If coming from Adelaide on the South Eastern Freeway, turn onto the Mount Barker exit and then right at the traffic lights, onto Adelaide Road. Travel past the BP service station and perform a U turn at the round-a-bout. Continue back toward the freeway and traffic lights on the corner of Druids Avenue. We are located just before the traffic lights on the left hand side. Number 43 Adelaide Road. Sign says Oakfield B&B with a white picket fence. Nestled in the Adelaide Hills township of Mount Barker. This 1850s historic home offers elegant private holiday accommodation with a high standard of comfort. The Oakfield Inn bed and breakfast is set among a beautiful gardens, and an easy stroll to main streets, shops, cinemas and restaurants. Experience a trip to historic Hahndorf 5 minutes away, or travel south to Strathalbyn (15 minutes) Goolwa and Victor Harbor (40 minutes). 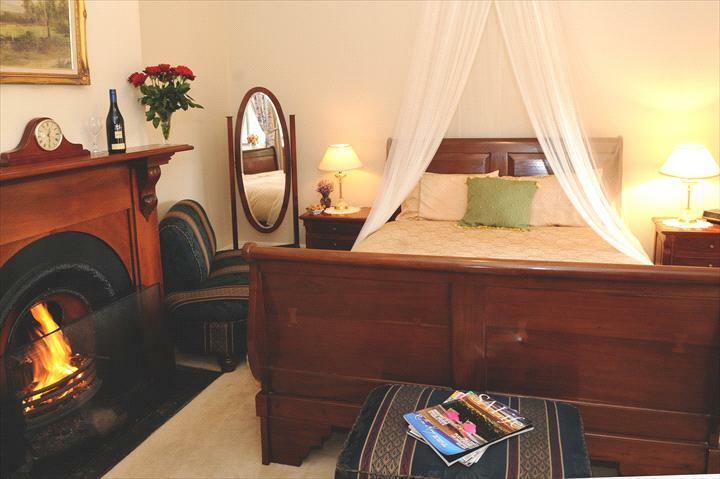 The Oakfield Inn provides a heritage b&b retreat for 1 or 2 couples. We offer 1 Queensize Room and 1 Double Room both with electric blankets. We offer a mini-bar fridge, toaster and Kettle. We have a 2 person Spa bath and an open fire in main front lounge. Cancellations less than thirty days prior to arrival will incur a $50 cancellation fee in addition to the booking centres cancellation fee. Cancellations less than seven days prior to arrival will forfeit all funds paid.